My Christmas present from Sue, a pair of hand-made clogs from Trefor Owen of Cricieth. About a year ago I went for my fitting. Outlines of my socked feet were drawn onto blank sheets of A4 with measurements over the top of the foot. 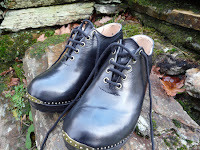 My feet were fondled to ascertain future bunions that could be accommodated into the design. After the measuring I selected the style and materials. He explained that the busy time was upon him as children were beginning to rehearse their dances for Eisteddfodau – I opted for the non-dancing version without fancy buckles and frills. I foolishly said I was in no rush which is why it took 12 months! I went for a fitting at which my toes were pressing into the front end. A few days later I went back to collect the final product which now fitted perfectly. At the moment I’m wearing them for 20 minutes or so a day to break them in and get used to them. With a wooden sole carved out of large chunks of sycamore (from Glynllifon, just up the road) there is a definite technique to be mastered. Next time you’re on holiday in the area why not order a pair? What a souvenir. We had heard there was a lead mine in the foothills of Moelwyn Bach. In fact we’d been there before and thought it was like all the other mines; a small stone building and piles of shale like debris. This time we were told to look out for globules of lead and pretty soon we found our first specimen. It took a while to get our eyes in and then we were finding all sorts of wondrous crystals. Maybe this was where Cromwell got his musket balls for the siege of Harlech? 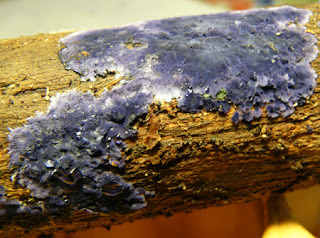 I’m used to finding things growing on my logs but this is the first time I’ve come across a royal blue growth. Does anyone know what it is? A Google search took me to a similar looking photo, taken in USA, describing it as blue lichen. 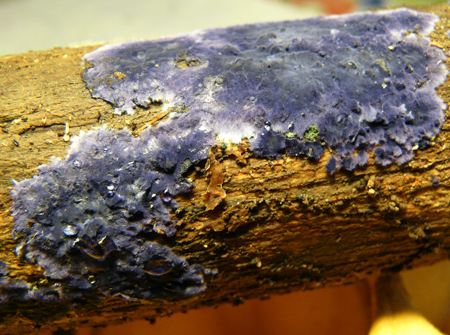 Thanks to my colleague Mandy Marsh at Natur Cymru I now know that this is terana caerulea sometimes called the cobalt crust fungus or velvet blue spread. According to Wikipedia it was chosen as fungus of the year by the German Mycological Society. It can be used for the creation of an antibiotic. Winds of up to 93 mph lashed north Wales sending Santa into a spin. As I lay in bed hoping the storm would pass I could hear his legs kicking at the window. Maybe we should not have waited until the 12th day to pack him away. But there’s nothing that a bit of string, glue and TLC can’t fix.